I've been working to increase engagement across all my social networks. I've been seeing the most change with Twitter, which is awesome. Still, it can be better. You should know which authors write books similar to yours. If not, spend some time on Goodreads and Amazon. I'm also finding Amazon email recommendations helpful. I get recommendations emails with my own books at the top of the list. When that happens, I look at the other books in that email. On Twitter, find those authors similar to you or authors who represent where you want to be in the future. Look at their followers and start following people. Don't blindly follow everyone. I ignore accounts with no bio, no header image and those that are clearly selling some service. Don't avoid writers. For my genre, fantasy, I learned most passionate readers are also writers. If the author isn't on Twitter, search for the book title and follow people who talk about the book. Some say you only need to tweet 3 times a day while others say to tweet 10+ times a day. Who is right? It depends. It seems there's no right or wrong answer to this question? The best answer is test and observe. I tweet about 5 times a day- on weekdays. Maybe more if an interesting hashtag is trending. How many times should brands Tweet per day? Most agree you should tweet important things like blog posts and book related info more than once to ensure more of your followers see them. When is the best time to tweet? Again, it depends. I use Tweriod to find out. 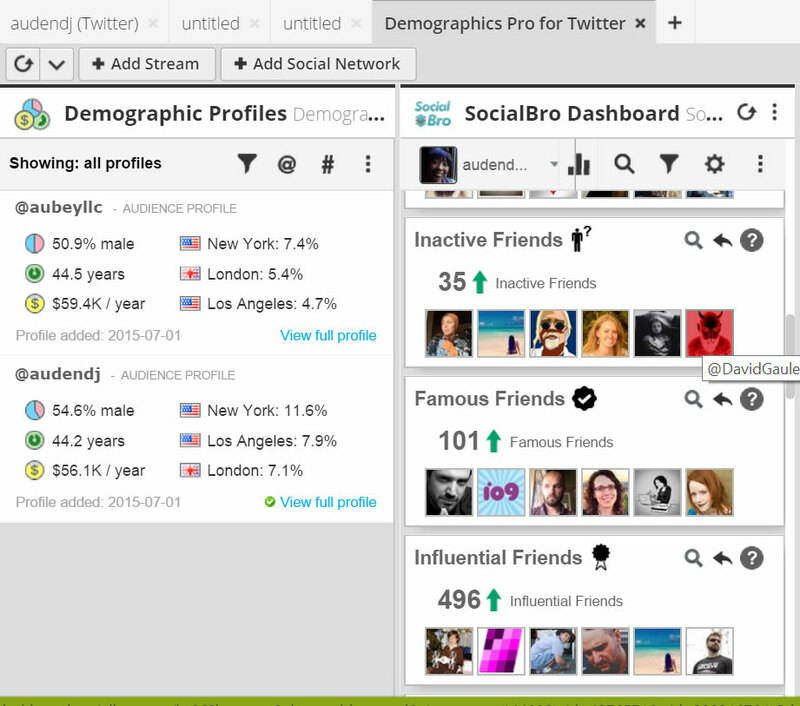 It examines your followers and gives you times most are on Twitter. I've been using it for a while now. Still effective. I've been using Tweetdeck. It's awesome. I kept hearing about Hootsuite. So, I tried it out. I like how you can manage more than one social network account in Hootsuite. The tweet creator has a built-in link shortener. However, Hootsuite limits the amount of columns you can create. Not a fan of that. Columns can be feeds from your lists, hashtags, scheduled posts and notifications. Tweetdeck lets me have more columns. 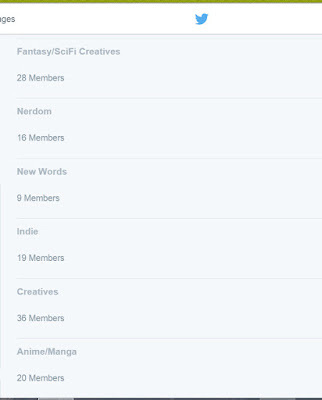 My lists plus hashtags I want to keep an eye on such as #darkfantasy and #amwriting all have a column. Tweetdeck Notifications make a sound so I know each time I get a retweet, follower or mention. Hootsuite is kind of a beast. Tweetdeck is so much easier to use. It isn't nearly as robust as Hootsuite, though. You've probably noticed that Twitter changed the quote retweet format. The quoted tweet is turned into an image, giving us more characters. I love this! Tweetdeck's quote retweet follows this new style. Hootsuite does not and it irritates me. But, I like Hootsuite's Apps. 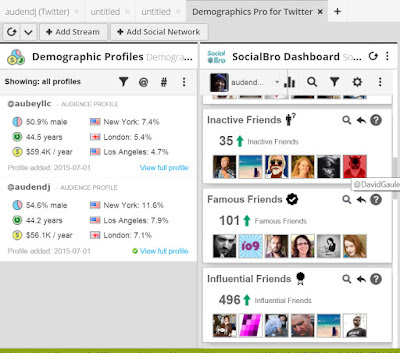 Demographic Pro gives me a breakdown of my audience. SocialBro gives a different breakdown. A Twitter webinar and another article talked about Socialoomph. First impression, I'm not a fan. I like feed style managers. I think I'll stick with Hootsuite and Tweetdeck. I'm a Library School graduate so I'm probably hardwired to organize info. I barely look at my Home feed on Twitter. As I mentioned before, lists and hashtags take up my Tweetdeck and Hootsuite account pages. 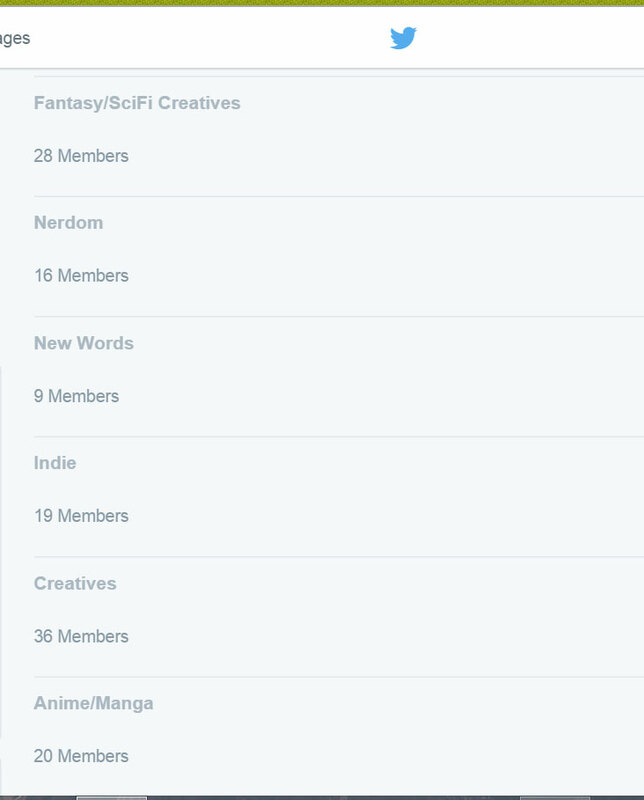 I go through my lists everyday. They make finding content to retweet so much easier. I don't know about you but I like getting that notification that someone's added me to a list. You've probably come across this many times but it needs to be repeated. The "Thanks for the follow. Find me on (other social network)" is spammy. It doesn't work. I don't read my direct messages anymore. If you want to thank new followers, mention them or retweet one of their tweets. I don't make a habit of having a post on one social network published on another. The only time I see that working is with Tumblr. I post on Tumblr and have it sent to Twitter. Even then, it's not something I do often. Each network has its own rules. It's own culture. Tumblr posts sent to my Facebook page had little reach and no engagement. Sometimes people will follow you across several social networks. You don't want them to keep getting the same content. I've read case studies for and against linking accounts. It's not something I do. Even if I'm posting the same content, book cover or blog post, on Twitter and Facebook, I find different ways of presenting the content. When I'm scrolling through my feed, tweets with images catch my attention the most. I'm not reading every tweet. I'm scanning. A cool image usually gets me interact with the tweet. How does this work for my own content? It depends. Having an image doesn't guarantee a retweet or favorite. It increases your chances. You've probably encountered this. You hit 2,000 accounts you're following and Twitter won't let you follow anyone else. What do you do? At first, instead of following those who follow me, I added them to a list. My follower numbers stayed the same, engagements didn't increase. Next, I went through the accounts I follow and started unfollowing people. Going through 2,000 accounts, not recommended. Then I found Crowdfire and Tweepi. They list your unfollowers and inactive followers. On Crowdfire, I started unfollowing those who've been inactive for a couple of months. Some were inactive for a year or more. That really cleaned my account. Please don't include hashtags in your bio. It looks way too desperate to me. Unless the person follows me first, I usually don't follow people with hashtags in their bio. You don't need to do that. Recently, I'm been using hashtags more. How many is too many? If your entire tweet is nothing but hashtags, that's too many. Two is enough. You can create your own. It's easy. Just add # in front of anything. My book titles are also hashtags. You want people to buy your books. Twitter, or any social network, is more for engaging readers and making connections. Readers like to feel as if they "know" the author. Social media helps with that.